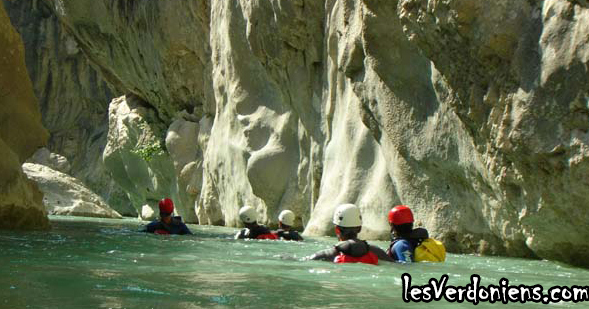 LES VERDONIENS Canyoning & Floating / Gorges du Verdon : CANYONING & FLOATING Au départ de la Palud Moustiers Castellanne Verdon Saison 2017 ! 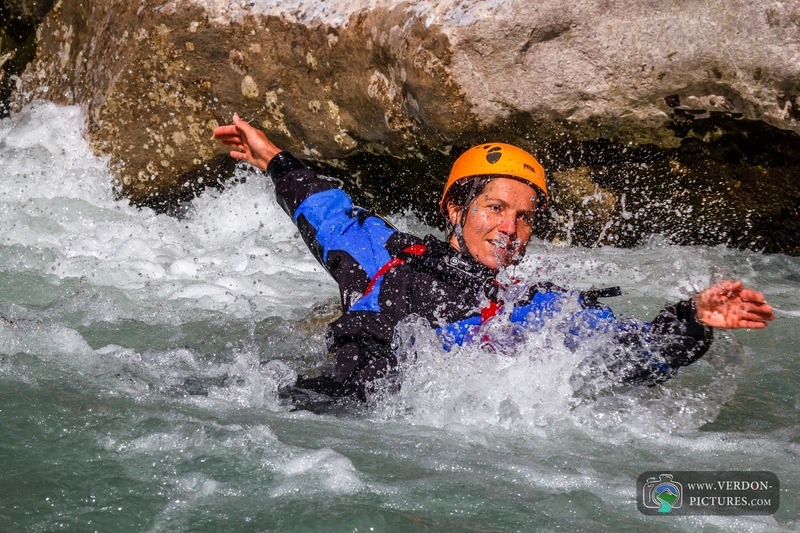 CANYONING & FLOATING Au départ de la Palud Moustiers Castellanne Verdon Saison 2017 ! Vous y découvrirez les activités et les tarifs ! The Site http://lesverdoniens.com is born ! 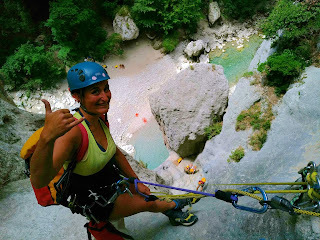 A structure for your activities in the Verdon canyon framed by one of the most recognized and experienced guides! 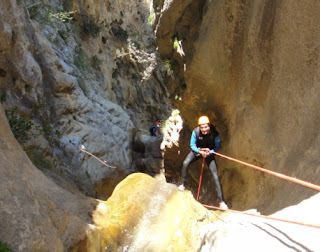 Welcome, here it is not the canyoning industry, the imperative is not at maximum profitability but the quality of the activity! And that changes everything! 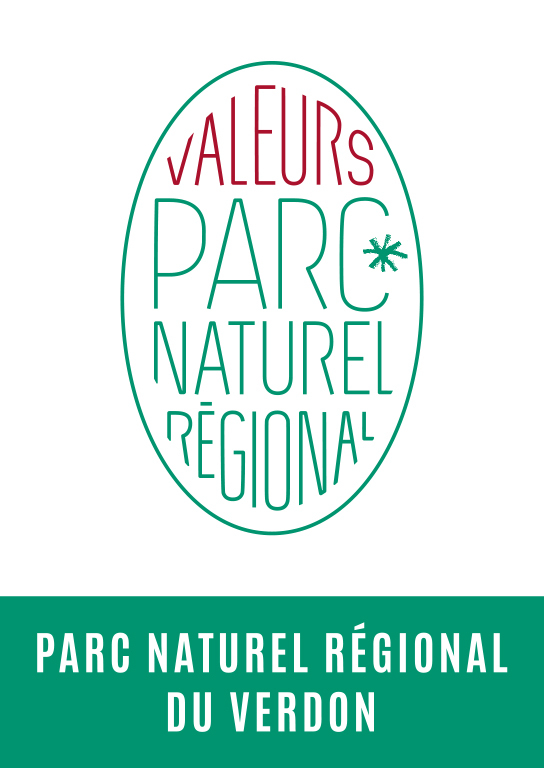 Deplus in connection with the long Verdon Regional Park, the 'Verdoniens' participate in trainings for better understanding and protecting the natural environment. This season we offer CANYONING & FLOATING ! 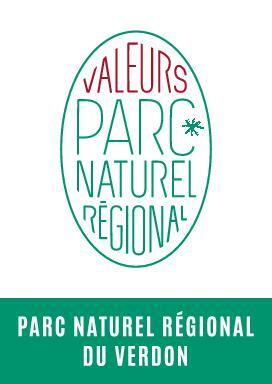 soon in the Verdon natural park ! Castellane / Moustiers sainte Marie, Rougon, La Palud sur Verdon. From 6 people, contact us for a group rate! But the middle remains the same, a medium made of rock and water, light and shadow, a fragile and sometimes hostile environment. Canyoning is a fun activity that you can also take in geological time, you discover sites of great beauty and feel intense moments. All activities are supervised by qualified instructors holder status OF BEES or JEPS. harness, helmet, wetsuit bootie and isothermal backpack and waterproof container. - Picnic for the course for the day. - A bottle of water in all cases. Initiation : all courses are half day. From the age of 8. Ravine Balène: Perfect start to the season ... A little gem lost in the foothills of Mount denier. Ideal for families with children. Aquatic and Vertical. 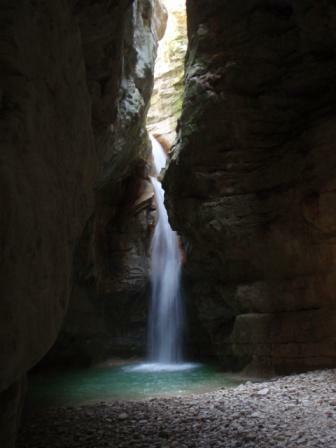 U n real journey to the heart of the earth , water in the spring, it becomes a dry course during the summer, but this little gem hidden behind the chapel of Our Lady in Moustiers remains a great adventure. Ideal for families with children. Vertical (and Water). 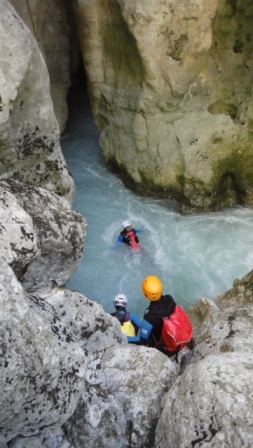 Canyon St Auban: more technical than others, very water in cold water, a fitness trail and engaged . Aquatic .Vertical. Development : all courses are the day. 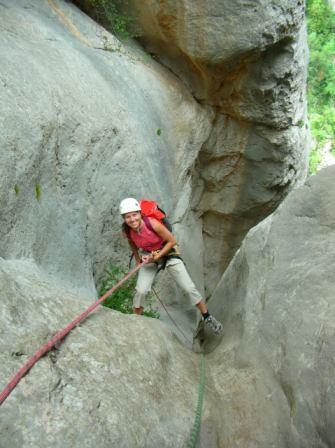 A legendary route ... A walk ¾ hours takes you from Moustiers St. Marie to the plateau overlooking the surroundings. 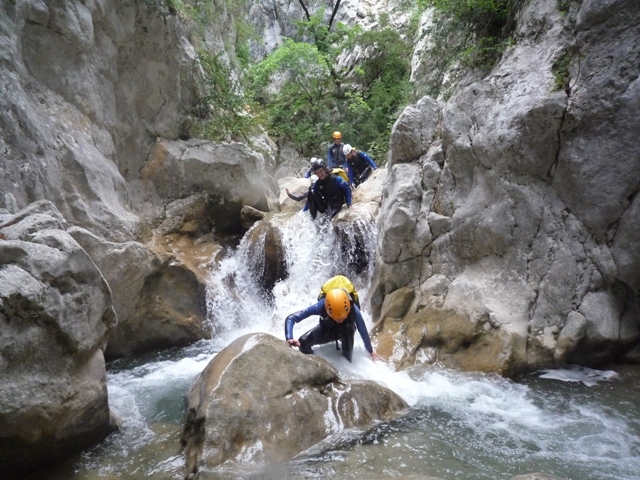 From there, you discover the Canyon Riou by a first part where water jump, slide and escalation transport you into a mineral medium. The second part, you discover the vertical rappelling joys in waterfalls where sky and water become one. The vertiginous access ... A succession of reminders and shady corridors, takes you into this mineral scenery until final reminder that will immerse you in the sun, in the Verdon emerald water. 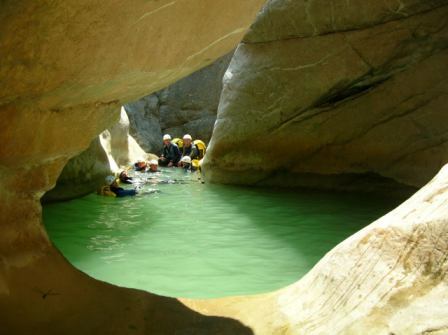 The suite will snorkeling up the river to the path of said Maugué (Bad ford) through the underground river Imbut. From there an ascent of half an hour will allow us to find civilization. Appointments: At Belvedere Mayreste. The anxiety valley ... This is a great approach walk which leads us from this canyon not to take the spring when the water level permits ... A real cool gem where many jumps and reminders lead us to discover along the route the semi underground room pear and a great resurgence and its ancient tuffs. Great reminders to Verdon ... A 20-minute walk on the trail bastidon then access Cabrielle (Cabre meaning goat in Provençal ...), takes us from the canyon where the great reminders s' linked together to immerse ourselves in the heart of Verdon. 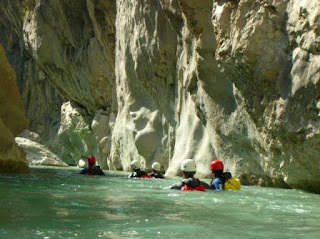 The result will be swimming or snorkeling to the pass of the olive tree. the rest will swim or snorkeling to the col de l'Olivier. FOR ROAD TO AN OTHERWISE NEAR OR FAR ... .. CONTACT US !! The floating or 'swimming in white waters is a new activity designed to explore the Canyon du Verdon. 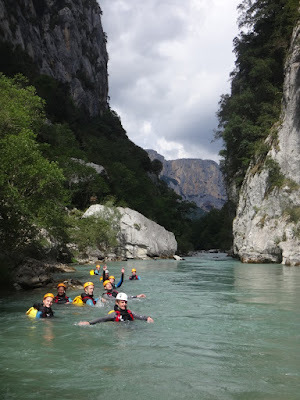 Armed with specific equipment (float bag, helmet, wetsuit, booties and gloves), you descend the Verdon to swim to discover the gorge from the bottom through magical places like balm to pigeons, the Styx, the 'Imbut the Baou blessed ... in the footsteps of EA Martel and former Verdoniens. Beyond this geological door .... a journey of stunning beauty. You move between cliffs over 300m to lose you in giant balms and blocks chaos forming mazes with strange shapes !!!! 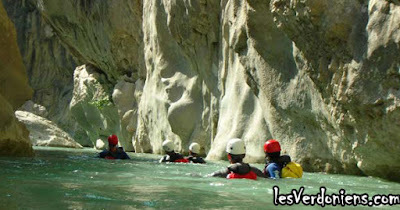 A fitness trail .... A foot descent from Chalet de la Maline takes us to the gateway of estelié or we dive into the emerald green water of the Verdon. To get down to the water lead through the maze of giant blocks, face the 'Styx' to finish in the underground river of Imbut. The return will be by the dizzying trail 'Maugué an ancient way of box cutters. 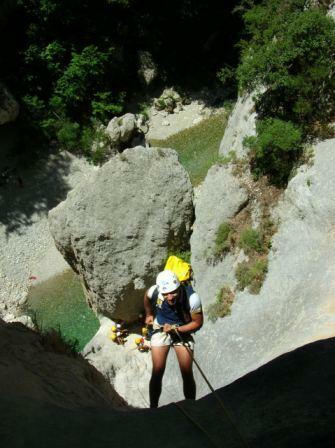 A direct descent to the famous marble hall of a former way .... Breakneck progress safely and crossing to swim the narrow last Verdon before the lake. 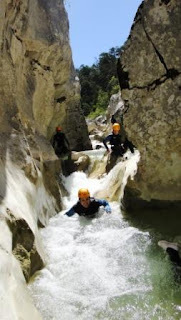 A first party walk through the tunnels of the old hydroelectric project takes you to the heart of the site of stops to go down to the Artuby, discover the parade sources Verdon then continue on to the gateway the Estelié where we will go back to the chalet de la Maline. 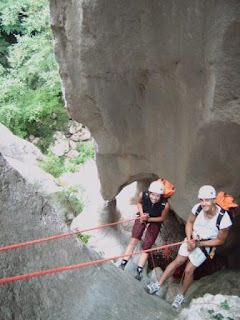 The legendary course ... a descent to the heart of the canyon !!! From the chalet de la Maline the foot descent through the famous White Martel trail takes us to the gateway of Estelié. Then alternate walking and swimming we will cross the last wild party canyon through which no path and where only water and rock dominate ... and discover the Verdon Secret. Subterranean River Imbut, marble corridor, blessed Bau, vault emerald ... We will go down to the lake to find our civilization that nevertheless seemed to have disappeared .. Choose GOOD GUIDE is essential! Responsible and safety organization whitewater. Nature lovers and sports, he Baroude around the world to live his passion. It sails a few of the most beautiful rivers in the world and explores chasms and sinkholes. 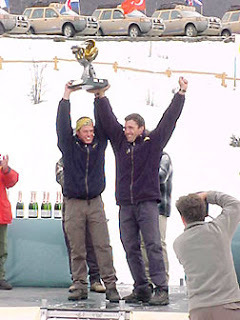 He participated in two Gallic raids then wins the Camel Trophy in 1998. 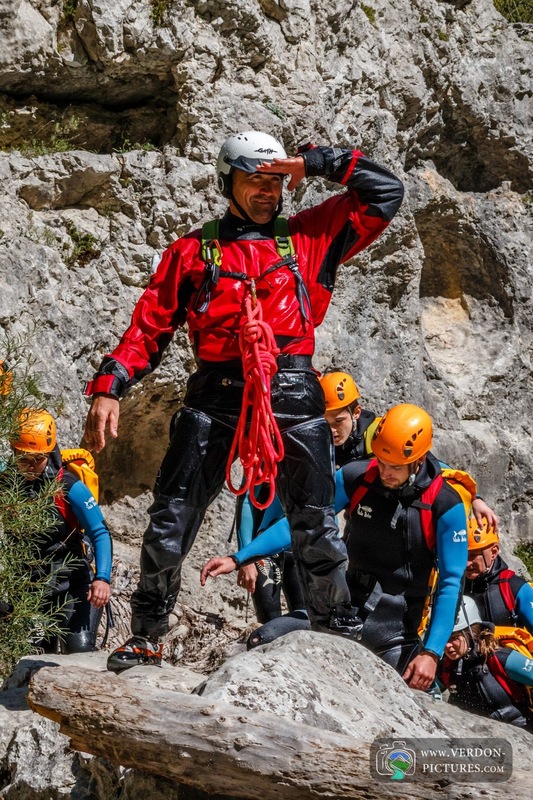 Cordiste, Pyrotechnician, Trainer and jury for rope access professional qualifications, work first aid monitor.